Recently we changed the Many Tricks store, and as a result, I needed to modify about 30 of my rules. As I was working on these changes, which requires editing and testing each modified rule, I noticed a most-frustrating Mail bug: The “Perform the following actions” section for all rules would slowly vanish as I edited my rules. Needless to say, editing a rule when you can’t see the Actions section is impossible. At this point, the only fix is to quit and relaunch Mail—this will restore the Actions section, at least for another 25 clicks. In the video, I click the Edit button for the same rule, just for ease of demonstration. But it doesn’t matter which rule you edit—even if you move from rule to rule, you’ll lose the Actions section after about 25 clicks. Hopefully this is fixed in 10.11.3—it’s not fixed in the 10.11.2 beta. Apple Mail: Classic or modern layout? That bug has been around for many generations of the OS. Mail is _always_ broken when a new (main) version of the OS is released, and takes forever to get fixed. It’s highly frustrating, especially for such a strategically important app. yes that bug is there, and it’s been there since Mavericks, so don’t get your hopes up for a fix…. Apple doesn’t seem to try to fix anything for two years now atleast, they are more interested in making everything “new” again…. which breaks even more stuff, so the number of bugs is critical now…. maybe someone with sense will finally enter the picture in that area someday in some not too distant future. but heck this bug pales in comparison to the fact that the rules don’t actually work in many situations. try turning off Junk mail too… and watch as mail continues to go to your junk folder…. Thanks, Rob! I’d noticed this as well. What app(s) did you use to create & edit the screen capture video? I’ve got a few bugs I need to file as well. I’ve written bug reports on precisely this for the last two iterations. They know but it’s not important enough to fix at this point. Sigh. Well, it hasn’t, and it makes rule editing a major PitA. I too got frustrated with the disappearing input boxes as I added more rules. I found a solution though that is working. Instead of adding multiple rules, for each rule, click the + sign within each rule to add another rule. Make sure that your logic is right (i.e. : if filtering for junk and simply deleting, make sure “any” is selected and not “all”) because Mail will go through all the conditions to perform an action on each email. This worked for me for sorting my emails into folders as well as long as I grouped the conditions together under each rule (i.e. : if…from…list email addresses here…move to this folder). I hope this makes sense and helps any frustrated users! I really appreciate this article. It confirmed what I’ve experienced in just two sessions with Mail in El Capitan. I jumped from Snow Leeopard, where I never saw this problem.The article, comments, and some things I’ve been reading about changes to OS X inspired me to contact Apple support where I just spent about an hour going through the process of explaining the issue. We did the usual, which is to set up a test user account, where I just had my iCloud emails to work with to set up rules. Even though the kinds of Rules I threw together were a lot less complex than the real ones that I’ve tried to do with my actual user account, sure enough, about 4 rules in, the vanishing act starts. It took some explaining and several screenshots, but the Apple chat tech finally “got it”. I was afraid I was going to have to set up a half dozen more dummy rules to convince her/him that this disappearing act really happens. The Mail tech people are going to call me tomorrow. My whole goal here is to help push this into a bug fix and I’ll be interested to see how this is handled. I do wonder if what’s going on with these kinds of bugs is that people don’t actually ever report the problem to Apple, or at least only a very small number ever do, especially if they are capable or (like Rob) are really savvy. Although I’ve had Apple products since 2007, I’ve only contacted tech support once before. I tend to Google and contrive a work around or use another program. I’ve read some articles that have stated the “push for new” and what I call “dumbing down” (removing some controls and advanced features) of OS X is caused by tons of calls from people who are…shall we say…the opposite of very savvy. One is left wondering what is the point of letting the tech underlings know. It’s now well over a year after you posted your remarks, and the situation is the same. I for one have had it. Windows has called another of its wandering sheep back into the fold. Still there in 10.11.5. Just filed a bug report. As if it will help. Still there in 10.12.3. Only workaround is to quit & re-launch Mail. I have just recently seen that rules are no longer being applied for some strange reason, so I took a look and found exactly the same problem indicated here with the hidden rules. This is with 10.12.5 and I can’t believe Apple has allowed this to continue for a couple of years. Yes, that has been happening here, too. Not only that, but the infuriating El Capitan updated un-applied all my Mail rules. I am SO fed up with all these bugs that I’ve decided to go back to Windows. Essentially El Capitan has broken my MacBook; the iMac still runs to some degree, but running under El Capitan, the MacBook freezes and crashes unpredictably and repeatedly loses the wireless connection. for what these contraptions cost, this is absurd. This week, it’s off to Costco to buy a Windows machine. Linc Davis, a clever and prolific former contributor to Apple forums, suggests the problem is a damaged Mail “Container” file (aka Sandbox file). He suggest seeing aside the container file and allowing mail to re-create it. Since Container files are supposed to be temporary, you should be able to delete the lot of them with impunity, but I would not bet my life on that working without side effects. I hate to say Linc is wrong, but … well, Linc is wrong. You can easily prove this by creating a new user account and logging in as the new user. Launch Mail and set up any given account (I used my iCloud account). Now go into Rules, and you’ll find the “Email from Apple” rule that ships with Mail. Click Edit, click Done, repeat. As you do, you’ll see the box vanishing, just as in the video in the post. Whatever’s going on, it is *not* a corrupted container file. I have Seira 10.12.4 and the problem still exists. I don’t know who the idiot at Apple that is charge of mail. This seams to me a simple counter problem and Apple should be ashamed of themselves for letting it be around for so long. The strange thing is that I had this problem and then at a certain point it went away, but who knows if it will return. Let’s hope it is fixed completely when High Sierra is released. Amazing. Thanks for the tip. You made my day! It worked OK with Apple Mail 10.3 (3273) on macOS 10.12.6 (16G29) Sierra. But in my case the fix was not just to quit and open Apple Mail again. 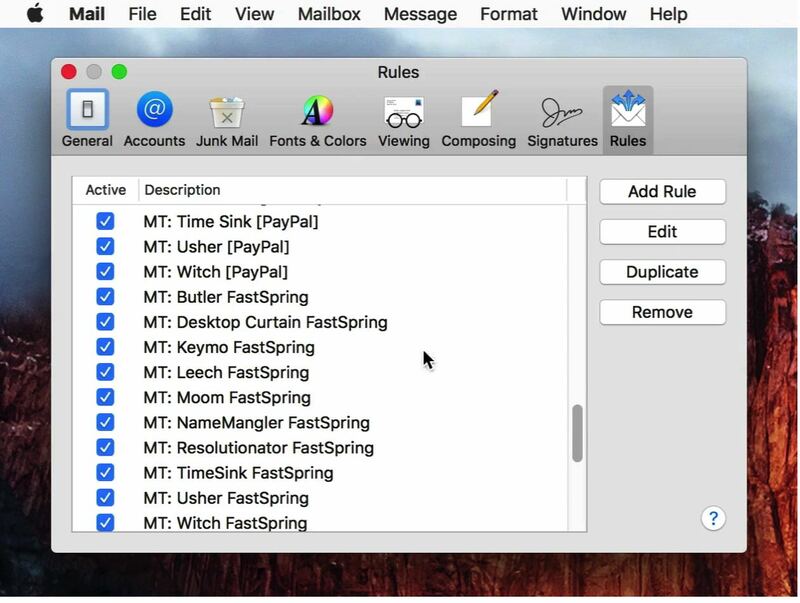 I had to first open Apple “Mail – Preferences – Rules”, select rule, click “Edit” (problem shows), click “Cancel”, close “Rules” windows, quit Apple Mail and open it again. Then the problem has gone. Try DUPLICATING an existing rule then, edit it and modify as required. I was able to add a few after the actions menu disappeared. Hope this helps. Tried this, thanks. But it did not work for me. The quit and reopen procedure worked for me this time! Thanks!! Bug still there in 10.13.5. The good news is that it seems — finally! — to be fixed in Mojave. Only about six more months to wait. Slight thread-jacking, but – on a somewhat related note – in Mojave, is the Mail prefs window fully resizable when on the Rules tab? I hate that High Sierra introduced a limitation on this. Not resizable at all, unfortunately. Sigh. I miss ResEdit. I mean, Interface Builder. They did finally fix it in Mojave, though. I can’t run Mojave on my machine, but I found a simple solution that has worked for me. Just add a new activity that you want to activate in addition to the default one and delete the default one. This gets you back to a full frame. It’s simple. Works most of the times. If it starts misbehaving, add a couple activities and delete all except the last one. Pete!! Thanks for that tip :D Totally works, even on Mail 10.3 (i.e. macOS Sierra 10.12.6). Before the (usually single) action completely disappears, for one given rule, I add another one below it, set it to the proper info & then delete the one that’s almost disappeared. Resets the ‘off by x pixels per rule edited’ bug, and I get get away with editing a bunch more, before having to do this again. Quicker than quitting & re-launching, and less disruptive to workflow.